imRenovating.com is a website that connect homeowners with top rated local professionals in the Home Renovation, and Design Industry. We also help educate both homeowners and trade professionals about the great products and supplies available through the leading industry manufacturers and retailers. Our service is quickly becoming available to online users in major cities across Ontario Canada. We are firm believers that a successful renovation project is the result of a partnership between the contractor and the client. This partnership is based on mutual trust and respect. It begins by the professionals analyzing each client's needs and by designing or building a product that uniquely fulfills those needs. It is maintained through constant communication with the client. It is strengthened by attention to detail and aesthetics throughout the project. We recognize that satisfied clients are the key to any trade company's success. ImRenovating.com helps establish Client / trade partnerships! To connect homeowners with the highest level of quality home renovation services at fair and market competitive prices. To help the the longevity of LOCAL trades and retailers through repeat and referral business achieved by customer satisfaction in all areas including timeliness, attention to detail and service-minded attitudes. To maintain the highest levels of professionalism, integrity, honesty and fairness in our relationships with our Users, sponsors, Staff, Partners, and Advertising Customers. To Become the "Ultimate" Home Renovation Trade Guide that homeowners in every major city in Ontario can count on. Recent economic factors show that home renovations or remodeling is booming in many parts of the country. Many People are now more likely to stay in their homes and renovate or remodel. Many contractors and trades are enjoying this growth. How many trades are not in fact professionals? How many homeowners have suffered financially and emotionally? How many homeowners have mistakenly hired the wrong person for the Job? Our business model is to provide our users with a helpful filter system, where every featured trade on our site, individually and collectively, dedicate themselves to providing our users (The Homeowner) with exceptional workmanship, extraordinary service, and professional integrity. and we do this through the involvement of the right team of professionals inside our office and out. ImRenovating.com helps establish the connection and partnership of homeowners and professional trades during the renovation process. We support the industry's products and supplies by educating both homeowners and trades about the many great products available on the market today to assist consumers make the right choice from day 1 of their home renovation project. ImRenovating.com helps homeowners and contractors be in touch with the the great product innovations by the industries leading manufactures. ImRenovating.com showcases the latest and greatest products that help simplify the home renovation process. 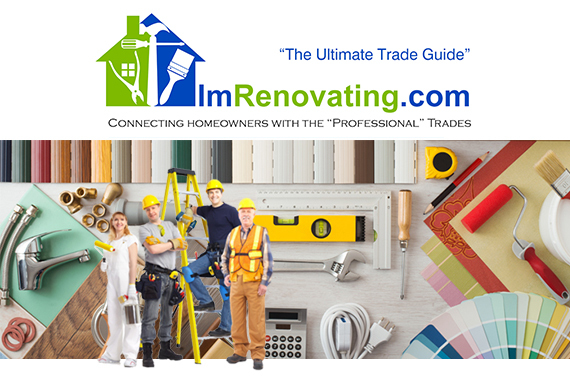 ImRenovating.com helps homeowners and contractors be informed of the many great products made available in the retail market through authorized distributors and retailers. ImRenovating.com features knowledgable retailers that help simplify the consumers selection and purchasing process. ImRenovating.com helps homeowners and contractors alike, The Homeowners benefit from using the right trades, and the trades benefit from satisfied clients and the referrals they bring..
Each City is independently operated by a regional management agency under exclusive licensing with imrenovating.com. Our mission is to bring the best care and support to each and every user and advertiser in each respective community we serve. We value our Management Teams. Through combined innovation and initiative we seek to retain only the most talented, responsible, and mature individuals dedicated to resource the right trade professionals to help maintain hi quality services to every homeowner that uses our website. We strive to team up with the best representative staff in North America to locate the best professional renovation businesses in each community and help support their skilled trades by introducing these real professionals to homeowners. Wouldn't you feel great to be rewarded financially and emotionally for helping others in the community thrive. If you're a seasoned professional sales representative, we have an offer for you to join our team.